Keeping your car clean demands a lot of time and effort, but it’s well worth it when you get to see the final result. Both car enthusiasts who enjoy working on their cars and people who hate even the thought of it agree on one thing – keeping your car clean is a must. Yes, it can be exhausting and time-consuming, but it also ensures a safe ride. Not to mention that all drivers love to show off their sparkling clean car that makes them so proud. However, while one may enjoy tiresome processes like polishing and waxing bearing in mind the final result, cleaning windows is a different story. Glass is a tricky material to clean, and most of us end up smearing the dirt all over the windshield. If you are to avoid dirty windows, blurred vision, and consequently serious collisions, you need the best window cleaner that you can find! If you’re searching for a universal window cleaner that will help you clean any glass surface, Sprayway offers just the perfect product for your needs. This is another highly popular glass cleaner that efficiently cleans dirt and stains. With Sprayway, you’ll have a sparkling clean vehicle in no time! As we said above, this is a multipurpose cleaner that allows fast and easy glass cleaning. It uses a clinging foam to break up dirt particles rather than move them around on the glass. This kind of foam also prevents possible drips and leaks that unnecessary waste the liquid. Therefore, Sprayway will probably last for a long time, allowing you to clean windows and windshields of your car effortlessly and quickly. Sprayway uses denatured alcohol without ammonia which allows simple and fast cleaning. The spray dries quickly and it doesn’t require exhausting rinses. It’s also important to mention that this cleaner won’t leave any strong smells or other residues. It actually leaves a very fresh and pleasant smell. We have to admit that this glass cleaner is very expensive although many users agree upon the notion that’s worth every penny. Considering its cleaning power and excellent finishing results, it’s definitely one of the best glass cleaners on the market. 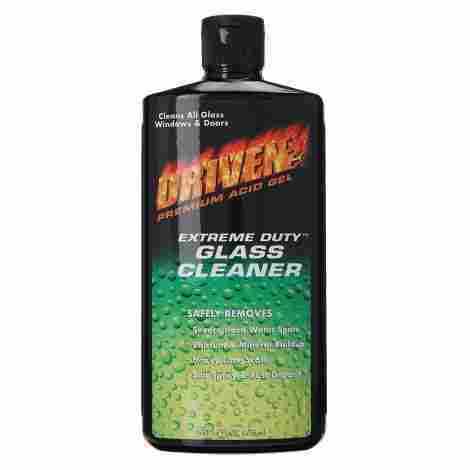 Driven Extreme is a heavy-duty glass cleaner that’s very popular among drivers due to its excellent cleaning abilities. This cleaner has some seriously good ingredients that will help you clean even the most persistent stains. You can use it on any glass surfaces, and we find it especially useful for cleaning car windows and windshields. As we already said, this is a heavy-duty cleaner that will help you remove grime and grease that piles up on your windshield. Cleaning the car windows can get pretty annoying, especially when you have to deal with stains that won’t come off easily. That’s why we included this window cleaner on our list. It proves to be better in cleaning persistent stains than many other cleaners on the market yet it doesn’t leave any residue. What users praise the most about this product is the ability to remove annoying water spots. You don’t even have to put a big amount of the liquid in order to get the work done. The only thing that we don’t like about it is the fact that it requires vigorous rubbing. If you want to remove tough stains you’ll probably have to rub a few times before you manage to take them off (just keep in mind that a lot of rubbing could scratch the surface that you’re cleaning). If you are tired of wasting your money on different cleaning products that can’t remove the stains from your windows, you should definitely try out Driven Extreme. The cleaner is definitely on the expensive side, but it provides excellent value for money. Therefore, if you have some extra cash to spend, go for Driven Extreme because it will clean stains that other cleaners can’t! 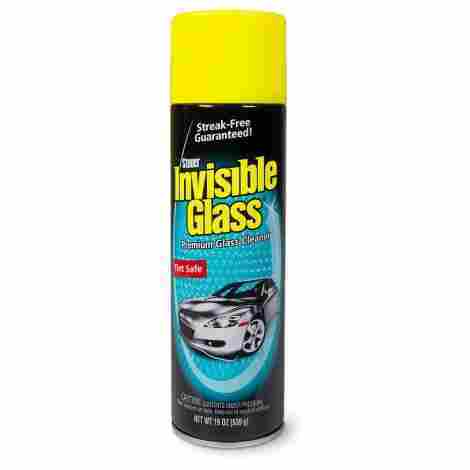 Invisible Glass is probably one of the most popular car window cleaners on the market. It works great on any glass, whether you need it for indoor or outdoor use, not to mention that it effectively removes persistent stains and piled dirt. Overall, Invisible Glass is a quality product that offers a simple cleanup and saves a lot of your free time, achieving excellent results every step of the way! This is a fine mist spray that should make the cleaning process very simple. It sticks to the glass so there won’t be any unnecessary drips. You won’t waste the product nor your money. 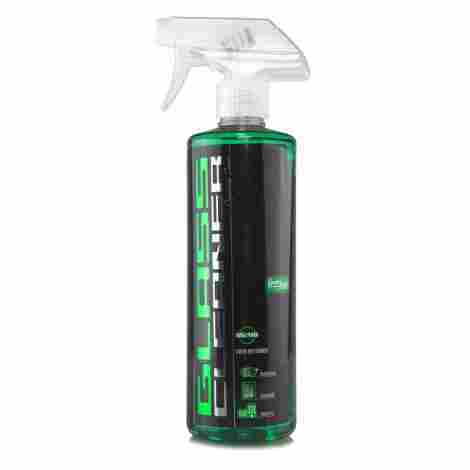 The cleaner is formulated to remove dirt that piles up on your windshield over time. You can finally say goodbye to all persistent stains that won’t come off when you use water for cleaning. The finishing results are spectacular, and just as the name says, you’ll have almost invisible windows! Invisible Glass cleaner is made from quality ingredients that allow a simple cleanup without any residue and strong smells. The cleaner is ammonia free, and you can easily use it to clean tinted windows. Along with that, this cleaner is s perfect solution for your car and house windows or any other stuff made of glass. It foams quickly and generously, so it will probably last for a long time! However, keep in mind that some users complained about having a hard time to wipe off the spray from surfaces. Invisible Glass is probably one of the cheapest window cleaners on the market. As if that wasn’t enough, you can purchase a pack of 2, 3, 6, and 12 bottles and save a few bucks! If you’re tired of trying to get the best results when cleaning persistent stains off the windshield and windows, you should definitely try out this Meguiar’s glass cleaner. We were quite amazed by the cleaning abilities of this product. It makes the glass shiny and flawless with just a little effort! Meguiar’s glass cleaner is a very useful product when it comes to cleaning car windows and windshield. A pretty small amount of this spray is enough to make your car sparkling clean - spray the liquid on the surface, wipe it off in gentle motions and that's about it. The spray will completely dry out in a few moments, leaving no residues. Keep in mind that you’ll have to use quality microfiber cloths or towels that don’t shed. Also, don’t spay a big amount of liquid on the surface that you want to clean because you won’t have such good results. It takes a little time to figure out these things, but other than that, you won’t have any other issues with this cleaner. We especially liked an anti-hazing formula of this glass cleaner. It effectively cleans the annoying haze that remains on the windshield even after the vigorous rubbing, giving you superior clarity during every ride. It also works as a dust repellent, keeping your windows clean for a long time. Let’s not forget that you can use this product to clean tinted windows too. Meguiar’s glass cleaner is a very popular product that offers excellent value. It’s not the cheapest option on the market, but it won’t cost you a fortune either so we can definitely recommend it. Here we have another popular glass cleaner that offers excellent value. Shine Society is an excellent option for those who want an efficient window cleaner that allows quick and simple cleanups. It removes piled dirt from the windshield and windows as well as it helps with hazed and smudgy glass. You can’t go wrong with Shine Society! First and foremost, this cleaner is incredibly easy to use. It spreads easily and it dries quickly. You can wipe it off in simple circular motions that will take only a few seconds. Shine Society won’t only remove the dirt from your windshield, it will also eliminate germs and bacteria, which is quite impressive for a budget-friendly product. Another great thing about this cleaner is its formula – it’s made of natural and sustainable ingredients which means that you can use it both indoors and outdoors. The only thing that should be improved in the future is the design and the quality of the bottle. It caused many issues for a lot of users. You’ll be pleased to hear that this excellent glass cleaner comes at an attractive price. The package includes two microfiber towels so you won’t have to purchase any additional stuff. Overall, you'll be quite satisfied with this inexpensive yet high-quality glass cleaner. Safelite is a well-known manufacturer that makes windshield and windows replacements. It also offers an excellent glass cleaner that allows an easy maintaining of the replaced vehicle parts. Safelite cleaner is a popular product made of quality ingredients that should help you keep your car in perfect condition. Moreover, it’s excellent for many glass surfaces, so you’ll find it useful in different household situations. Safelite uses a clinging foam which means that there won’t be any dripping and wasting of the liquid during the cleaning process. The cleaner should last for a long time, ensuring excellent finishing results on a daily basis. Spray it, wipe it off in simple circular motions, and let it dry. The cleaner foams quickly and generously, so you don’t need to apply a big amount in order to clean a dirty surface. It also dries quickly, and it doesn't require additional rinsing and polishing. However, some streaks could appear on after the cleanup. It doesn’t happen that often, but some users have complained about it. This cleaner is made of quality ingredients (includes denatured alcohol) and it doesn’t contain ammonia. It effectively removes piled dirt, stubborn stains, grease, and grime, leaving your windows sparkling clean. You can also use it to clean tinted windows and other types of glass. Additionally, Safelite proves to be an excellent cleaner for both indoor and outdoor purposes, but it does have a strong smell, so make sure that you use it a well-ventilated area. 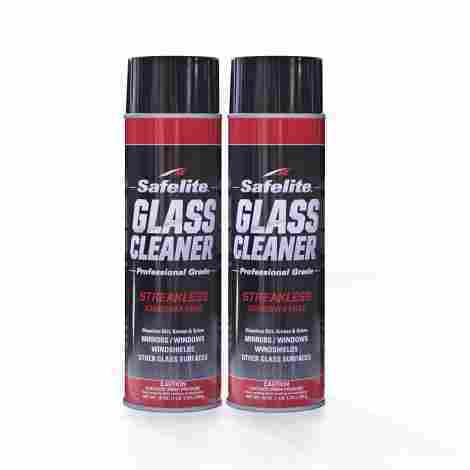 Safelite cleaner is a perfect option for those who want a multipurpose cleaning product and don’t want to spend the fortune on it. Overall, this budget-friendly cleaner offers excellent cleaning results, and it compares to first-class cleaners that have a sky-high price. You can also choose a pack of 2 or 4 cleaners if you want to save even more cash! 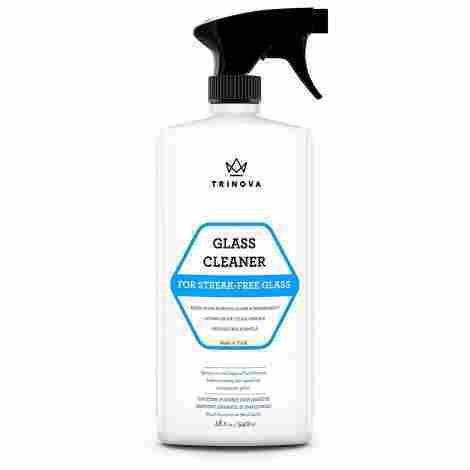 TriNova features an excellent glass cleaner that will help you keep your windows clean from dirt, dust, grime, and grace. This product is especially useful for cleaning your car windows and windshield as it offers outstanding finishes. Furthermore, you can use it to clean any glass surface with great efficiency! TriNova features an easy-to-use cleaner that offers excellent cleaning results. Spray it once or twice on a dirty glass, and you’ll get rid of all those persistent stains that regular glass cleaners can’t remove. Not to mention that you get to avoid the tiresome process of rubbing the stains off and rinsing the liquid over and over again to achieve the perfect finish. TriNova proves to be very efficient and easy to use. As we already said above, TriNova is made of quality materials and offers outstanding finishes whether you’re removing dust, dirt or stubborn water stains. It’s one of the rare cleaning products that don’t leave any streaks on the cleaned surface. Additionally, it will be easy on your respiratory tract because it doesn’t have a strong smell like other harsh cleaners. Last, but not least, you’ll be pleased to hear that TriNova doesn’t approve animal testing! We certainly gave them some extra points because of this. This TriNova glass cleaner definitely stands out from the competition and it offers great value, but we have to admit that it’s on the expensive side. The thing is, we were a bit annoyed finding out that this cleaner comes only in an 18-ounce bottle. There are no big packs that could save you some money, or bigger bottles at all, which is a big drawback compared to other options on the market. If you’re searching for a heavy-duty glass cleaner that will remove stubborn stains and all kinds of dirt that pile up on your car, 3M is a perfect choice for you! We are talking about an easy-to-use glass cleaner that allows a sparkling clean finish. Whether you think car cleaning is a relaxing hobby or you can’t stand even the thought of it, you’ll love this glass cleaner for its excellent performance and efficiency. If you want to find more about it, keep reading our in-depth review! 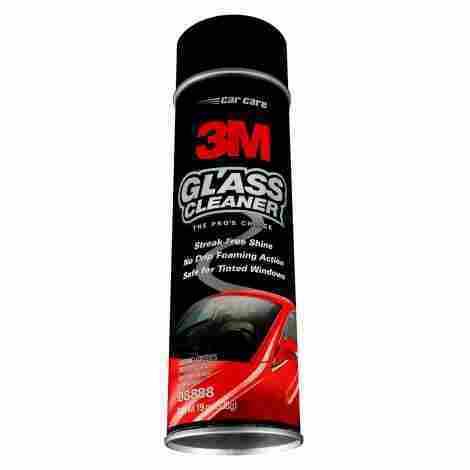 The 3M glass cleaner is made from quality materials that are safe for both indoor and outdoor use. This cleaner is not only an excellent option for maintaining your car’s exterior but you can use it to clean interior plastic. It foams quickly yet it clings to vertical surfaces so there won’t be any drips during the cleaning process. What’s even more important, 3M cleaner doesn’t leave any streaks nor residues, making your car exterior shiny and sparkling clean. 3M glass cleaner allows for simple and quick cleanups whether you have to deal with a small amount of dust or with persistent stains that just won’t come off your windows. It will make you fully satisfied with the results. The cleaner features a special formula that quickly resolves stubborn stains so you can easily wipe them away rather than smear the dirt on your windows, and make the things even worse! Additionally, you can use this product to clean tinted windows, but make sure to be in a ventilated area when you use it. The cleaner leaves a strong odor that could be harmful to your respiratory tract. As if its outstanding cleaning abilities weren’t enough, 3M glass cleaner comes at an attractive price. This makes it ideal for cleaning your car’s windows and windshield as well as maintaining another stuff made of glass around your house, so don’t hesitate to make it the part of your house cleaning equipment. 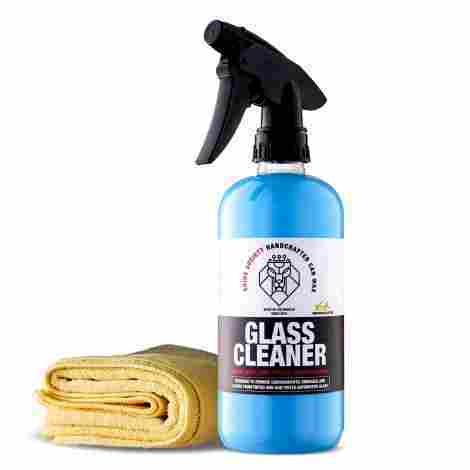 Here we have an outstanding glass cleaner that comes in a modernly designed bottle. It can effectively deal with all kinds of dirt and debris, and it's safe for any type of glass. You can use it for simple and quick cleanups yet it allows fast resolving of tough stains. Therefore, if you need a multipurpose glass cleaner that will give you a flawless finish and make your car shine on the sunset, this is a perfect choice for you! Keep reading if you want to find out more about this high-quality glass cleaner. Chemical Guys offer a heavy-duty glass cleaner that can easily resolve stubborn stains and piles of debris that your car collects every day. This is a multipurpose cleaner, which you can use in various situations and for different surfaces, that reduces the overall cleaning time and achieves excellent results. With Chemical Guys, you’ll be able to perform quick cleanups and keep your car maintained all the time. Chemical Guys offer a professional grade formula without ammonia. 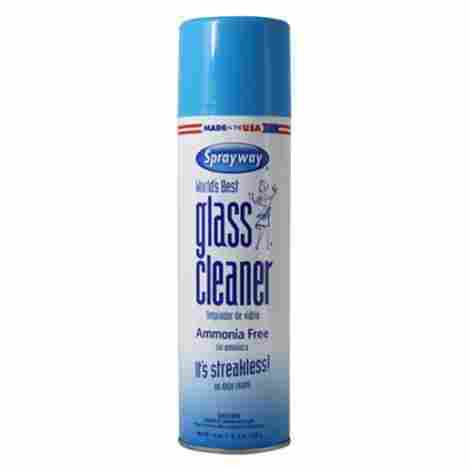 It means that this glass cleaner won’t leave any strong smell and it won’t be harmful to your car components. You can use it to clean both interior and exterior windows as well as tinted glass. It’s even safe for cleaning screens! Who doesn’t need a strong cleaner for phone or computer screen? Additionally, this formula works as a dust repellant and keeps surfaces clean for a long time. 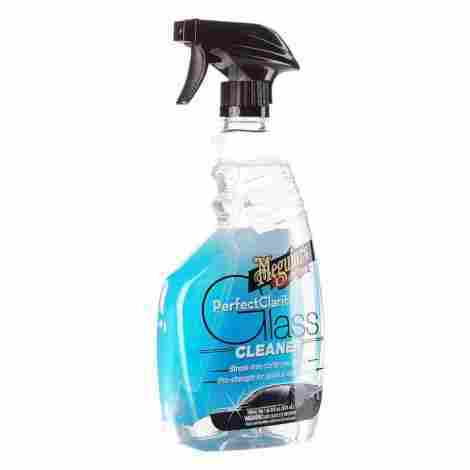 This glass cleaner is definitely a high-quality product that will easily clean all kinds of debris from any kind of glass surfaces, but it is a bit pricey. Nevertheless, if you have a few bucks to spend on a new cleaning product, you should definitely try it out, especially because most users think it’s worth every penny. You can also go for big packs that contain several bottles of this cleaner if you want to save some money. Here we have a popular glass cleaner that made it to the top of the list provided by a leading consumer magazine. This cleaner reached the first position on the list several times in the last 10 years. Nowadays, there are many cleaners that surpassed it in terms of quality and performance, but it still has to offer excellent value! Hope’s Perfect glass cleaner is made from quality ingredients that allow for simple cleanup and perfect finishing results. The cleaner works faster than usual glass cleaners, resolving stubborn stains and dirt. It features a streak-free formula so you’re safe from annoying residues that won’t come off no matter what you try. Additionally, you can use this product to clean your phone, tv, or computer screen (just don’t spray it directly on the device). The only we didn't like about this glass cleaner is the fact that it requires a lot of effort if you want to remove the toughest stains and leave the glass perfectly clean. The glass cleaner offers an ammonia-free formula that ensures high performance no matter which surface you’re cleaning. The overall design of the cleaner has only one flaw – the bottle lacks adjustment. It has a too high velocity that isn’t suitable for every cleaning task, and it often wastes the liquid unnecessarily. 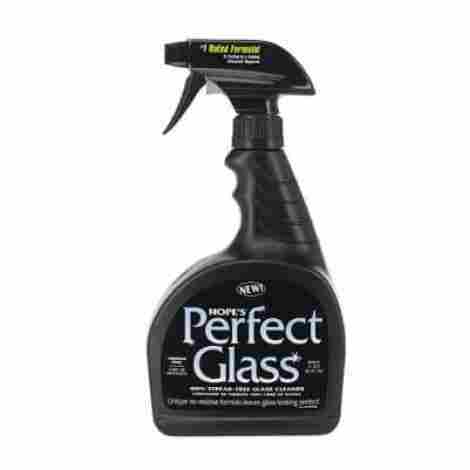 Hope’s Perfect glass cleaner offers outstanding performance, and it comes at an attractive price. It can easily become a part of your car cleaning routine, and help you achieve perfect results every day! First thing first, we wanted to be sure that every product on our list is made of quality ingredients that ensure excellent performance. Due to the fact that our list contains only the best products on the market, it was hard to rank them according to the ingredients because all of them have to offer quality formulas. The thing that does differ in every product is the finishing result. First-class cleaners leave no residue or streaks, and they are on the top of our list. The ones that do are ranked lower. We also took into the account a strong smell and possible irritations that could occur from the use of harsh window cleaners. That’s why the safest ones are on located higher on our list, while the ones that could emit unpleasant smell are at the bottom. What we mean when we say performance is the ability of every glass cleaner to clean the glass efficiently and leave it sparkling clean. The top products on our list are definitely offering the best cleaning results. They leave no residues, work efficiently and fastly, resolving dirt in no time. The ones that could demand more effort when cleaning, or require more time to take off the dirt and stains, are at the bottom on our list. Let’s not forget that car cleaning demands a lot of time and effort, and having a glass cleaner that requires endless rubbing and rinsing is just not a great option. The main goal is to find an efficient glass cleaner that will speed up the cleaning process and help you remove the dirt without much effort. You shouldn’t have any issues with simple things such as spraying the cleaner on the surface and wiping off the dirt. The glass cleaner should also provide a big amount of foam from a tiny drop of liquid, ensuring durability and perfect results. That’s why had to compare all products on our list and then rank them according to their quality, performance, and user-friendly experience. While it might seem that the design of the glass cleaner isn’t so important, it does have an important role in the overall quality of the product. It’s certainly not as essential as quality ingredients but it seriously influences the cleaning process. For example, a poorly designed bottle will make you spend a lot of time, preventing you to spray the liquid in the desired amount and in the desired way. Also, a fragile bottle could easily get damaged or leak and waste the liquid, and consequently your money. Last but not least, we took into account the cost and value of every product on our list. Everybody wants to get a valuable product for the money. No matter if we are buying a budget-friendly glass cleaner or a very expensive one, we want to know that it will fulfill our requirements and stand up to our expectations. That’s why cost and provided value were so important to us during the evaluation. You probably laid eyes on a certain glass cleaner and you’re impatient to make the purchase, but we recommend taking a few more moments to think about it. If you want to be completely sure that you made the right choice, there are some additional factors that you could consider before the purchase. Which type of surface you’ll be cleaning? Think about that before you decide which glass cleaner to buy. For example, not all glass cleaners have the formula that allows for cleaning tinted glass. If you want to clean tinted windows, you might want to be sure that the cleaner is safe for this type of surface. The same applies to other materials, and it’s very important when it comes to cleaning your car’s interior. Many glass cleaners are not safe for cleaning car plastic parts, and some can even damage the paint finishes. Take it into account while considering which glass cleaner is the best for your needs and your car. Which type of glass cleaner do you need? If you’re a car enthusiast you probably clean your vehicle once a day, so there are no persistent stains that you should take off. However, those who are not so excited about the idea to clean their car that often might want to consider getting a heavy-duty cleaner. The type of cleaner you need depends on the type of dirt and stains you’ll be cleaning, because not all glass cleaners can efficiently clean all kinds of debris. If you can’t decide which glass cleaner to get, go for the one that’s most efficient in removing the dirt that bothers you the most. Do you only need a car cleaner, or would you like to have a multipurpose cleaner that you can use for cleaning other stuff around your house? Multipurpose cleaners could be more expensive than the ones designed for car window cleanups, but they have to offer more. On the other hand, buying a one-purpose product means prolonging its use, so you won’t be spending money on your new cleaning supply any time soon. Q: Can I use vinegar to clean car windows? A: Of course you can! Vinegar is actually quite efficient, and it will make your windows sparkling clean. It can be even more efficient than cheap window cleaners that tend to smear the dirt all over the windshield and windows. You’ll need a cup of vinegar and a cup of water (make sure to sip an equal amount of liquid in both cups) as well as a spray bottle where you can mix this up. Make sure to protect other parts of your vehicle so that vinegar doesn’t reach to them. You’ll also need a microfiber cloth which you can use to clean your windows. It’s simple as that! Q: Should I wear gloves when using a glass cleaner? A: It depends on which type of glass cleaner you use. Some of them are heavy-duty products that can resolve even the toughest stains but because of that they leave a strong smell and could be harmful to your skin. A regular glass cleaner shouldn’t be that strong, and you could use it without any protection. However, we recommend wearing gloves in any case, just to be sure that you’re safe from potentially harmful chemicals. Q: Can I use a household glass cleaner to clean car windows? A: Well, you can try using it, but we definitely don’t recommend it. The main reason why household glass cleaners aren’t good for your car is ammonia. This ingredient often leaves streaks or awful haze on your car’s windows and windshield, which could obstruct your view and lead to dangerous situations. Q: Can I use a glass cleaner to clean the touchscreen? A: Using a glass cleaner on the touchscreen is not recommended. However, there are some glass cleaners with special formulas that allow for doing this. They are safe for your phone’s touchscreen as well as tv, laptop, and other types of screens. Keep in mind that we are still talking about a wet substance that could cause some damages to electric devices, so don’t spray the liquid directly on the screen. Use a microfiber cloth or other soft materials to clean the device, and apply only a small amount on it. Q: Will glass cleaner damage the car’s paint? A: Some heavy-duty glass cleaners might contain chemicals that could damage the car’s paint. Glass is a solid material made from liquid sand which means that we need a powerful cleaner if we want to take off dirt, grime, and grease from it. On the other hand, automotive finishes are soft, as they are sprayed on the components, and they could get damaged by strong cleaners. While not all glass cleaners are equally harmful, the safest thing you could do is to get the separate spray cleaner for automotive finishes. Yes, it requires some additional effort and money, but it’s the best thing you could do for your car.